I would like to hear comments about the Bentinck memorial on Mansfield Marketplace, a piece of architecture which has had a very chequered history, and perhaps is largely ignored or taken for granted now. 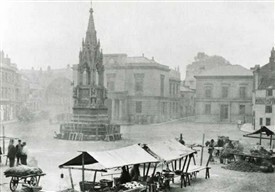 Erected in 1849 as a market cross and was funded by public subscription, and is incomplete as it is missing the statue which should have gone in the space at the top, but they ran out of money and the statue never made it into the memorial. It came very close to being demolished in the 1960s as it had by this time become unsafe, and two large chunks of masonary were reported to have fallen off. 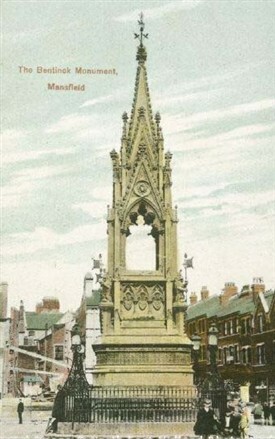 The Town Council were given quotes of £1,000 to demolish it and £5,000 to restore it in 1967, and demolishing it was seriously considered but for the Old Mansfield Society making strong representations to keep it, claiming it could never be replaced and was unique. Nevertheless the vote was close and the town council voted 12 to 8 to spend £2,000 to restore it and basically make it safe. Has anyone got thoughts about the memorial or perhaps parking their car next to it - when you could park your car on the market place. I was wondering what reaction there would be if money had to be spent on it in the future, surely we would not demolish it now? This page was added by Tony Clement on 21/12/2016. The memorial was the work of Nottingham architect T.C. Hine, I think, and erected in 1849. The missing statue was to be of Lord George Bentinck in whose memory it was erected. It could not possibly be even considered for demolition now. It is recognised as being extremely important as one of the earliest examples of the Victorian Gothic Revival, as well as being one of the easiest 19th Century Gothic structures to look at, since you can stand so close. Some interesting 19th Century prints of it in Mansfield Library which make it look a bit taller and more elegant than it really is! I wonder if Tim Bentinck the actor a descendant of Lord George Bentinck has any comment to make on the subject. I was googling to see if this was a Elenor Cross (as at Charing Cross Station). I'm in the Victorian Soc. and Brick Soc. I'm obviously pleased to see this survive. If you look at St. Pancras Grand Hotel (1876) in London you will notice many plinths without statues due to lack of funds. My father in-law Alec Maskill was an architect and the councillor who lead the efforts to retain the memorial. He tells of going up in a cherry picker to inspect the damage and plan the restoration effort. Alec was also consulting architect to the diocese and restored many churches. He designed and supervised the building of St Paul's church in Manton Main in Notts. "From the funds of a general subscription, is now in course of erection in the market-place, to the memory of the lamented Lord George Bentinck. "The very beautiful design is by Mr T.C. Hine of Nottingham, the Architect, and the building is committed to Mr Lindley of this place [ie Mansfield]. "The work progresses well, and will, when finished, be an exquisite structure in itself, and a fit tribute to the indomitable courage and energetic eloquence of him who stood so boldly forward, and so ably combatted what he deeply felt to be changes fraught with hazard to the prosperity of his country".